"Easy to make salad for those who like rocket leaves (arugula)." Whisk together the olive oil and balsamic vinegar in a large bowl. 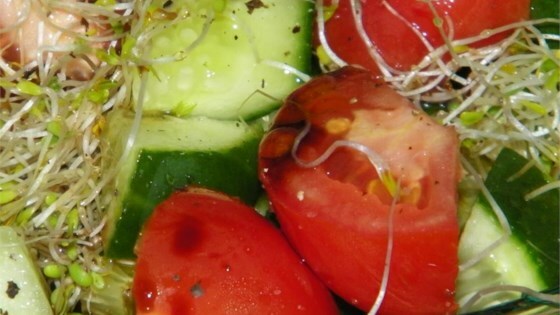 Add the cucumber, tomatoes, arugula, and alfalfa sprouts; toss to coat. Season to taste with salt and pepper before serving. I left out the alfalfa and used my own vinaigrette - and the first cucumber from my garden. Fresh, beautiful, excellent. Excellent through and through! A veritable cornucopia of flavour for the taste buds, that kept my mouth entertained to the end. This works perfectly for a tasty and simple salad. I used baby spinach this time and will try the arugula next time I have it. Balsamic compliments leafy greens very nicely.